I want to invite you to a very special, unique, exclusive five star resort on the coast of Southern Spain. This amazing five star resort has its own beach, four swimming pools (one indoor and three outdoor pools), a restaurant (with both indoor seating and outdoor seating), a snack bar, a beauty spa, a sauna, a steam room and plunge pools and a well-equipped fitness centre. The beautiful five star accommodation is in spacious luxury apartments with private balconies and many with garden views and partial sea views. In each apartment you have either three or two bedrooms, with two bathrooms (bath and shower), a lounge, dining room and a fully fitted kitchen with fridge/freezer, oven, hob, microwave, dishwasher, washing machine and dryer. The accommodation is to the highest standard. Each apartment has a luxurious master bedroom with a huge bath and a separate double shower. In some of the three bedroom apartments the second bedroom has a private balcony. I know you are going to love this place. This will be a Spiritual Health Weekend like no other. It will be a place to rest, relax and enjoy the sun and the wonderful surroundings, but also it will be a place where we can explore with a small group of people the depths of God’s love and grace. We will have sessions with intimate worship and inspiring teaching. You will have individual prayer and prophecy slots with Nancy and her team. You will receive words from God and feel completely restored, blessed and encouraged inside and out. You will enjoy a free pamper treatment from one of my team. We will have optional fitness sessions on the beach (weather permitting) and at least one meal together. You will discover how to make Paella and enjoy eating it afterwards. There are also many optional extras you can choose to have including a champagne breakfast. There will be plenty of time for relaxing in the sun as well as discovering more about yourself and your own relationship with our incredible God. The cost of this depends on your choice of accommodation – please contact us for costs. I’m looking forward to hearing from you and seeing you in sunny Spain next year! The conference will run from 10th – 13th May 2019. 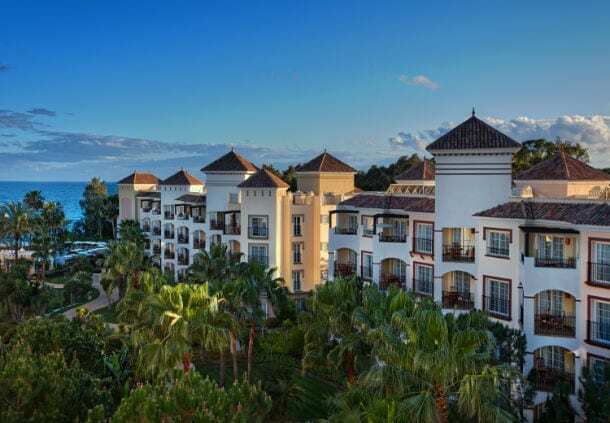 It is being held at the 5* luxury Marriott Playa Andalucía resort near Puerto Banus and to the south of Marbella. The nearest airport to the hotel is Malaga airport, which is approximately an hour’s drive away. As we have said, the accommodation available is in beautiful luxury apartments. These can either be 3 bedroom, 2 bedroom or single units. The booking form shows the different types of accommodation available and the rooming options within these apartments. As we have said there are fully fitted kitchens in the apartments and there is a small supermarket on site where you can get a selection of breakfast, lunch and dinner items, and a large supermarket just a small walk from the resort. There are also a variety of restaurants and snack outlets outside the resort as well. If you want to come with a group of friends, we have possible accommodation options for up to 8 sharing, please email or call Zoe to discuss the best options. The costs include all the conference sessions, all optional sessions, one meal at the hotel including drinks package and also paella demonstration class (with Sangria) and afterwards you can eat the delicious food you have made! It also includes the accommodation you indicate on the booking form and also full use of all the hotel’s leisure facilities. There are optional extras you can add on such as a champagne breakfast and extra meals. You are responsible for organising your own flights. We would like delegates to arrive before 2pm at the resort on the 10th. Your apartment might not be ready until 4pm, however there will be a conference session starting before then. On the 13th there will be a conference session in the morning so we would suggest you arrange return flights after 4pm. (Should you wish to add any extra nights to your stay, this may be possible, contact Zoe to find out more). 01454 414880 or email zoewickham@ngm.org.uk.